I recently came across this great infographic, “Backed Up: Septic Tank Problems and How to Prevent Them,” and wanted to share it. There’s a lot of great information, but I wanted to add some thoughts I had while reading. 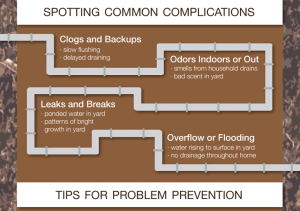 Check out the graphic and then scroll down for some more tips on keeping your septic system in good shape (click the picture to view the whole graphic). If your system is newer, some septic system problems and abuse can be prevented. Here are some simple things you can do to keep your system working its best. Items flushed down the commodes and poured down the drains do not disappear. They have to be treated by your septic system. Things that can harm your system include feminine products, wipes (baby wipes, makeup remover wipes, disinfecting wipes, etc. ), grease, paints, oils, cigarette butts…basically anything except toilet paper. Economy in use of household water is recommended. Avoid taking long showers and doing several loads of laundry consecutively. Quickly fix dripping faucets, running commodes, malfunctioning water softeners, etc., as they can cause a system to flood out. A caveat about tank sizes mentioned in #3 in the infographic: Regulations for septic tank sizing differ in Texas. For example, the infographic indicates a 900-gallon tank in needed for wastewater usage under 500 gallons per day; Texas regulations require a 1,250-gallon tank for the same amount of water usage. Pump out your septic tank regularly to prevent the solids from accumulating too much. This can cause the drainfield to clog and require expensive repairs. The frequency of pumping will depend on your tank size and number of household occupants. Whether you need a septic pumping, inspection, installation, or maintenance, we’re here to help. We’ve been servicing septic systems since 1937, and offer free phone consultations. Contact us online or give us a call at 830.249.4000 (Boerne) or 210.698.2000 (San Antonio). I am an electrician and take on other jobs at times. I was asked to check out a pump motor in a septic tank that is overflowing at times unless they kick the above ground pvc and then it starts pumping so I think that could be the float switch. When the motor is not running there is a thump thump thump sound in the pvc pipe that is the outlet going to I guess the drain field or maybe another tank? I’m thinking another tank because it seems the water is running back in when the motor quits pumping. The owners know nothing about the property or where anything was wired or piped in. I recently pulled the motor up and hosed it off cleaning off the stuff clinging to it. Now it seems to run fine when filling it empty’s ok but the thump sound is still there. Also the spot where the motor is, is right behind a small guesthouse off from the main house and it seems all the sewage is going to this spot to be pumped out. Looking at the many diagrams onliine nothing shows up like this. This one looks like a man hole cylinder the pump about five feet down to the bottom and an outlet pipe. This doesn’t seem there would be time for the solids to dissolve and that would clog the motor I’m thinking. Do you think there is another tank somewhere on the property like at the main house? Also, the main house is uphill a bit. I’m not sure about the thumping sound, but if water is flowing back into the tank after the pump turns off, make sure there is a check valve or that it is not faulty. Generally, there would be another tank somewhere. Perhaps this is a lift station to pump the waste from the guest house to the system for the main house. My suggestion would be to contact the local septic system permitting authority to see if they have any records of the system. ← What Happens If I Don’t Pump My Septic Tank?